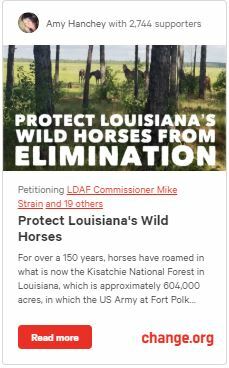 May 2018 caring individuals answered our call for help in saving Louisiana’s Wild Horses evicted by Fort Polk Officials. Today, 15 of those Fort Polk horses rescued need a permanent home. Funds are being raised for the purpose of preserving and protecting the horses and other equine animals that exist on the lands of Fort Polk and lands of the Kisatchie National Forest; to promote and establish rescue mechanisms and sanctuaries for wild or other equine animals; to facilitate programs related to the rescue of said equines in the event that their removal from Fort Polk becomes necessary. Donations can be used for any of the following purposes: Future rescue, fostering and adoption efforts, feed, hay, water, veterinary care or other equine care, resources, supplies or equipment, purchasing/leasing of facilities, shelter, land or equine transportation; as well as advocating for enforcement of Animal Cruelty Laws, NEPA and NHPA through legal assistance; to advocate for proper welfare and stewardship of wild or abandoned equine animals (e.g., horses, mules, donkeys, and related animals) wherever they may be found, initially and specifically including those equine animals that exist within Fort Polk, Kisatchie, its training areas, including the main post and the Peason Ridge training area, and all such U.S. Military controlled lands in the area, and the lands of the Kisatchie National Forest, especially that part adjacent to Fort Polk lands, and where wild or abandoned equine animals may roam. Our current and immediate need is to facilitate placement for 15 wild horses that were captured during May 11th, 2018. These 15 wild horses have been in a holding facility and are in desperate need of finding a permanent home. Previous Post Help Needed: Fort Polk Horses Need a Home!